Design is a central theme in Mercier‘s work. Ordinary objects designed with the ambition to be modern are subject to his appropriating way of working. His arrangements of objects and interventions make reference to modernity and post-modernity. Shop culture and high culture converge in his works and presented in a museum or gallery context a certain estrangement is created. 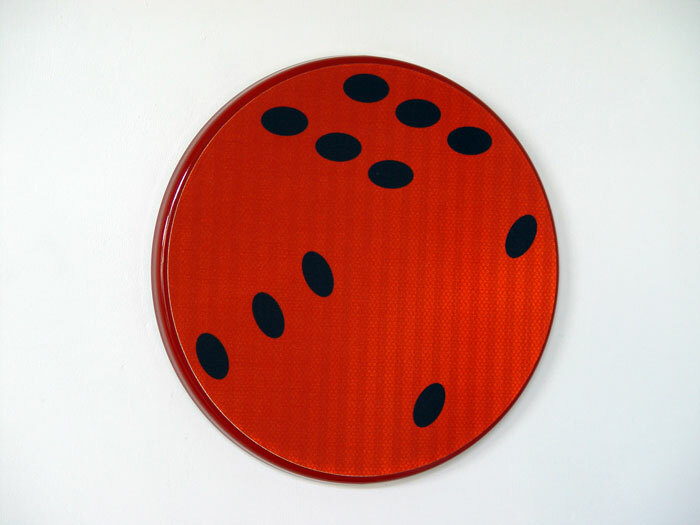 He combines ‘non-art’ materials of common household objects with art historical references by making use of e.g. the primary colours Mondrian used. In Dé a three-dimensional dice is depicted on a reflective road sign combining circle, cube and dots. It may be looked at as a ‘non-art’ material that has the aura of modernity or contemporary art.